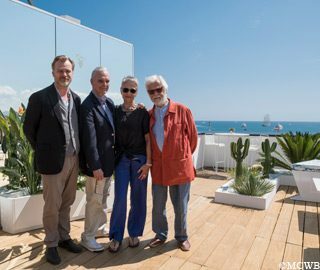 For the 50th birthday of Stanley Kubrick’s masterpiece 2001 : A Space Odyssey, the Mouton Cadet Wine Bar welcomed the afternoon British director Christopher Nolan, along with Stanley Kubrick’s daughter, Katharina Kubrick, actor Keir Dullea and co-producer Jan Harlan. Loving connoisseur of Kubrick’s work, the multi-award film maker worked hand-in-hand with Warner Bros studios on the restoration and remastering of the 4K film, in its original version 70mm format. The 2018 version of the legendary film will be presented as world premiere tomorrow, on Sunday 13th May.